Comments: The Barclay House is a small townhouse on Scottsville's Lot 31 and is next door to the Disciples of Christ Church (now Scottsville Museum) on Main Street. John B. Hart purchased this property without a structure in 1830 and resold the lot six months later for his original purchase price. On January 1, 1838, Daniel P. Perkins sold Lot 31 with its 'house and lot on Main Street' to Sarah C. Harris, mother of James Turner Barclay. By 1850, Dr. James Turner Barclay and his family lived in this house next door to the Disciples of Christ Church where he was its first minister. The house's side entrance, shown here in this photo, was the front door to the Barclay's home. In 1851, Dr. Barclay went to Jerusalem as his Church's first missionary, and turned over his Main Street home to Thomas Staples, an Elder in the Disciples of Christ Church. 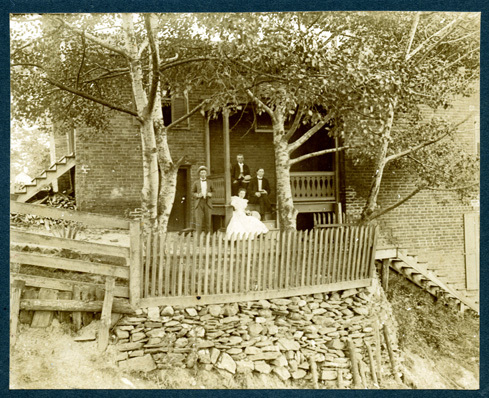 Later Elizabeth Staples Davis lived here with her family, who are shown sitting on the Barclay steps in this 1900-vintage photo. Today the Barclay House serves as Scottsville Museum's historical and genealogical resource center. 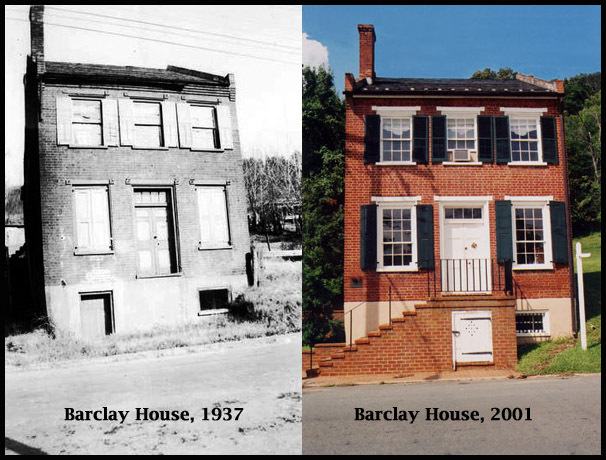 Shown below are photos to compare how the Barclay House looked in 1937 and how it looks today in 2001. The 1937 photo is part of the Historical Inventory Report by R.E. Hannum for the Works Progress Administration of Virginia; Record No. VHIR/02/0282 applies at the Library of Virginia, Richmond, Virginia.